I have always had a passion about food and nut rition in the early years, and have spent the last few years researching early development and health eating. I was able to put this experience into practice during my own pregnancy and subsequent birth of my son. 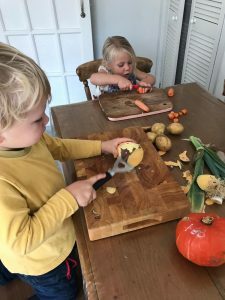 Through the early food experiences I offered my son during his weaning period, I now have a teenager who is confident when making healthy food choices and who has an insane appetite for Brussel sprouts and cabbage! To stimulate and promote healthy growth and development, a balanced diet must be introduced from birth. Our commitment to this means that lunch, snacks and a main meal* is all home made with fresh and locally sourced products (where possible) nutritionally balanced, and will include a variety of different flavours and recipes from around the world. Our menu planning will involve the children as much as possible, as we believe in order for them to make healthy choices children need to be given the opportunity to do so. But don’t worry, it won’t be fish fingers every night (if a child asks for this, they will be homemade, and if possible the children will help prepare them!). Please see the sample menu of dishes that may be included in a weekly menu. We will also ensure that any dietary needs or food intolerances/allergies will be catered for, and an alternative dish will be provided. If your baby is approaching the weaning stage, we can discuss how you intend to introduce him or her to their first food experiences (baby led, or traditional approach) and a weaning plan will be created to ensure babies needs are met. When we’re not picnicking down the beach, in the garden or park, all meals will be eaten at our kitchen table. Mealtimes are a social time (as well as a valuable learning opportunity), so table manners, independence in making choices and self-serving (where age appropriate) and conversation about our day will always be encouraged. However, food and mealtimes can sometimes be quite a challenge for some children (and their parents). Through the training we have undertaken (Level 2 course in Food and Nutrition in the early years, NDNA Allergen training and Food Hygiene) as well as years of experience in supporting parents with ‘fussy’ and ‘picky’ eaters we will hopefully be able to offer support and advice to promote positive eating habits and mealtimes.